Is four thousand miles a long way to go without a cup of joe? Apparently Lewis and Clark thought so. They packed away 50 pounds of coffee beans for their cross-country expedition. The history of coffee in the Americas is quite fascinating. Coffee was first recorded as a beverage in North America as early as 1668. 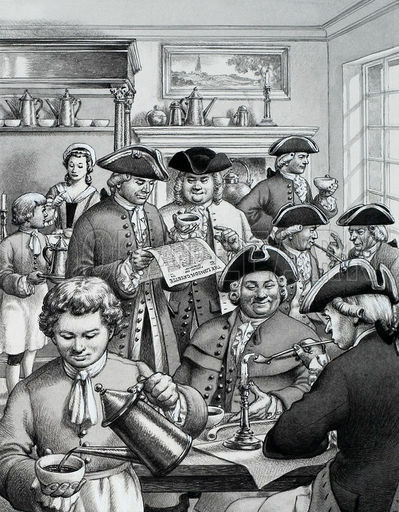 During colonial times, tea and coffee were equally favored, and many taverns doubled as coffee houses. By the mid-1700’s, coffee houses were flourishing in New York, Philadelphia, Boston and other colonial towns. Ironically, the Boston Tea Party Of 1773 was planned in a coffee house, the Green Dragon. 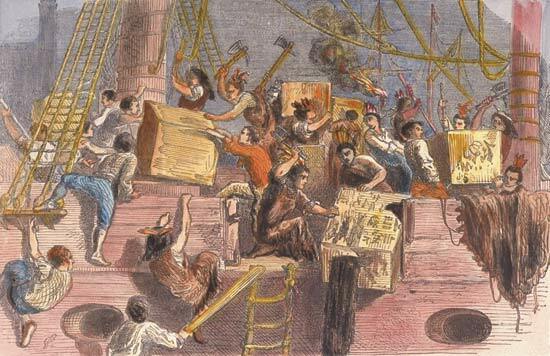 As a side effect of this famous protest, in which a group of irate colonists dumped a large shipment of tea into Boston harbor to protest the British tax on tea, it became unpatriotic to drink tea, therefore giving coffee a huge boost in the American market. The Dutch first started the spread of the coffee plant in Central and South America, where today it remains a dominant cash crop. (For a fascinating fictional look at the early days of the Dutch coffee trade, I recommend The Coffee Trader by fellow Texan David Liss.) The Dutch first planted coffee in its colony of Suriname in 1718, and soon established plantations in French Guyana and Brazil. By 1730, The British had also moved into the coffee business in Jamaica, where some of the most famous coffee in the world is still grown in the Blue Mountains. Following the Revolution, coffee had not yet taken tea’s place as the primary hot beverage in America. Too expensive to drink every day, it was consumed primarily for medicinal purposes rather than as a breakfast beverage, and this is no doubt why Lewis obtained the fifty pounds of coffee for the expedition’s stores. The caffeine stimulant, then as now, helped to sharpen the mind and invigorate a tired body. The method of preparing coffee in Lewis and Clark’s time would have been time-consuming. 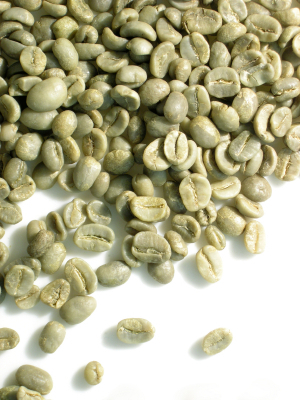 Green coffee beans were roasted over a stove or open fire, ground in a mortar and pestle or a hand mill, and then boiled with water until done. The flavor was not what we enjoy today but was still sometimes just what the doctor ordered. a fair worm morning, Clouded & a few drops of rain at 5 oClock A. M. fair I feel my Self a little unwell with a looseness &c. &c. put out the Stores to dry & Set Chabonah &c to Cook for the party against their return—he being the only man left on this Side with me I had a little Coffee for brackfast which was to me a riarity as I had not tasted any Since last winter.